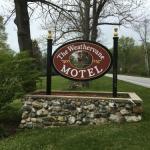 Sitting on six manicured acres dotted with gardens hammocks and lounge chairs plus a seasonal outdoor pool the Weathervane Motel also provides comfortably furnished rooms with mini-fridges and free Wi-Fi. The single-story non-smoking motel has 22 individually decorated rooms that feature free Wi-Fi and premium cable TV including HBO. Rooms have coffeemakers mini-fridges and hairdryers. Continental breakfast is served at the farmhouse table in the lobby. During the summer months a hammock or a lounge chair provides the perfect perch for soaking up some sun and a heated outdoor pool invites guests to make a splash. Additional amenities include laundry facilities and ski storage. Parking is free and pets are permitted for a fee. The motel is one mile from Equinox Golf Resort and Hildene the Lincoln Family home. It's 15 minutes by car to the Dorset Playhouse and three miles to Southern Vermont Art Center. The skiing at Bromley Mountain is 10 miles away. It's 17 miles to Stratton and 25 miles to Rutland Southern Vermont Regional Airport.